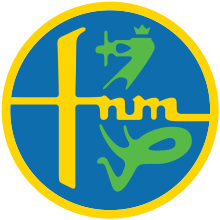 FNM logo, largely inspired by the Alfa Romeo logo. Fábrica Nacional de Motores (FNM) was a Brazilian manufacturer of engines and motor vehicles based in the Xerém district of Duque de Caxias near Rio de Janeiro that operated between 1942 and 1988. The company was created 1942 by the Brazilian state as part of the Estado Novo agenda of President Getúlio Dornelles Vargas. It was one of several business launched by the state during this period (including also Companhia Siderúrgica Nacional launched in 1941 and CHESF in the later 1940s) to kick start an industrial sector in Brazil. Initially the company produced American Curtiss-Wright aircraft engines under license along with ammunition, bicycles, spindles and refrigerators. After the Second World War it was decided to diversify production. The government was keen to launch a vehicle manufacturing industry. In 1949 an agreement was reached with the Italian manufacturer, Isotta Fraschini, whereby FNM would produce the Milanese company's heavy trucks under license. Isotta Fraschini commercial vehicles enjoyed an excellent reputation at this time, but the Italian company was already economically troubled, although its formal bankruptcy would be put off till the end of 1951. 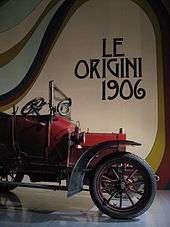 The disappearance of Isotta Fraschini as a vehicle manufacturer left FNM looking for a new technology partner. In 1952 an agreement was signed with Alfa Romeo, another Milanese vehicle manufacturer. Unusually in Europe, Alfa Romeo was (like FNM) a state owned business, following bankruptcy and a government rescue in the 1930s. Under the agreement with Alfa Romeo, FNM would manufacture Alfa Romeo's commercial vehicle range under license. Though little known north of the Alps, Alfa Romeo commercial vehicles were well established in Italy, and other south European markets. Between 1956 and 1960 FNM built more than 15,000 heavy trucks of Alfa Romeo design: it also manufactured the chassis for buses and coaches. In the Brazilian heavy truck sector which FNM dominated till the early 1970s, FNM was initially the only manufacturer. 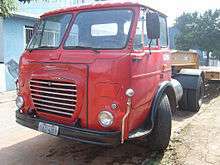 Trucks produced by FNM were generally nicknamed "Fenemê". In the mid-fifties a company called Fabral S.A. (Fábrica Brasileira de Automóveis Alfa, "the Brazilian Alfa automobile factory"), a collaboration between Alfa Romeo and Brazilian investor Matarazzo, was set up to build the Alfa Romeo 2000 (tipo 102/B, "B" for Brazil). The car was to be built in Jacareí, in the state of São Paulo. The Matarazzo Group backed out in 1958, following troubled discussions about the suitability of building luxurious cars in poor Brazil. After pressure from then-President Juscelino Kubitschek FNM, in which Alfa Romeo already held a minority interest, took over the project. In 1960 FNM's first passenger car was launched, the FNM 2000, a Brazilian version of the series 102 Alfa Romeo 2000 four-door sedan (berlina). The factory ended up being built in the Xerém neighborhood, of Duque de Caxias, Rio de Janeiro instead. The engine was the same 1,975 cc twin camshaft unit found in the Italian product, but detuned to produce only 95 PS (70 kW) and the car received the FNM logo. This series of cars was named "J.K." in honor of President Kubitschek who had helped make the deal take place. This was by far the most luxurious, and most expensive, car built in Brazil in the period. A coupé version was offered from 1966. Known as the FNM Onça ("Jaguar"), the coupé did not follow the line of any Alfa Romeo design, but featured an elegant locally designed body unmistakably reminiscent of the original Ford Mustang. The regular FNM 2000, meanwhile, was followed by more powerful versions, culminating with the 130 PS (96 kW) TIMB ("Turismo Internazional Modelo Brasileiro"), now boasting usefully more power than was claimed for its Alfa Romeo cousins of the time. The TIMB also featured a flat bonnet with a lower-mounted grille, as suggested by Lincoln Tendler aiming a better aerodynamic penetration, and a divided front bumper to accommodate the lower centerpiece. This same front design was also used for the succeeding FNM 2150, with some detail differences. In 1968 Alfa Romeo acquired a controlling share in the hitherto state-owned FNM business. The next year the FNM 2000 was replaced by a restyled version, the FNM 2150, the most obvious visual differences affecting the front of the car. For this application the twin camshaft four cylinder engine saw its capacity increased to 2132 cc, and performance was further enhanced through the installation of a better set of carburetors. The five-speed gearbox was the same one used in all cars made up to that moment. The FNM 2150 would continue in production from 1969 till 1974. In 1971, another coupé called the Furia GT 2150 was presented to the public. Based on chassis and mechanics of the FNM/JK 2150 cc model, the car was designed by Brazilian designer Toni Bianco. Only a few hand built examples were produced, but the stylish coupé may have helped the public image of the by now aging design of the mainstream FNM 2150. Bianco later made some sporting creations carrying his own name. Alfa Romeo had disposed of its commercial vehicle operations in Italy in the 1960s, and in 1973 the FNM commercial vehicle business was sold to Fiat's industrial vehicle division, while Alfa Romeo retained responsibility for the FNM automobile business – subsequently FNM's commercial vehicle business ended up being absorbed into Fiat's Brazilian Iveco business. The FNM 210 clearly shows its Alfa Romeo origins in design. 1974 saw the FNM 2150 replaced with the Alfa Romeo 2300. This was the end for the FNM badged cars: the FNM badge itself, obviously inspired by the Alfa Romeo badge, was also replaced on this car with an actual Alfa Romeo badge. The general look of the new car was very similar to that of the Italian built Alfetta sedan, designed by Giuseppe Scarnati and first offered in Europe in 1972, although the Brazilian car was actually 41 centimetres (16 in) longer and 7 centimetres (2.8 in) wider than the Alfetta. Under the skin, the 2300 was based technically on the older Alfa Romeo 1900. The gear box of the 2300 was conventionally located adjacent to the engine and not (as with the Alfetta) across the rear axle. Like its Brazilian predecessor the 2300 featured a four-cylinder twin-camshaft engine, now of 2310 cc with a claimed output of 140 hp (100 kW). A maximum speed of 170 km/h (106 mph) was claimed. For the 1985 model year the 2300 was renamed as "Alfa Romeo 85". This model was manufactured until November 1986. Marketing opportunities were identified in Europe where Alfa Romeo's locally designed attempt to move upmarket had made little impact on the competition from Bavaria: the Brazilian Alfa Romeo was offered briefly in 1981 under the designation Alfa Rio and distributed by Alfa Romeo Germany. Additionally, around 600 of the cars were shipped to The Netherlands. Alfa Romeo faced difficulties in Europe during the late 1970s and early 1980s, coming under increasing commercial pressure from the three largest German up-market auto producers even in Italy. Objective financial data concerning nationalized businesses are seldom published, but Alfa Romeo is believed to have operated at a substantial loss for much of its time under state control: in 1986 Romano Prodi who was at the time chairman of the IRI (the government body responsible for nationalised industries in Italy), wishing to reduce the losses of the IRI, transferred Alfa Romeo to the private sector, which in Italy's mass market automobile business meant at this time Fiat. Since 1976 Fiat had been developing its own Brazilian operation, based in Betim. The Brazilian-based car business that had formerly comprised FNM was accordingly integrated into Fiat's own Brazilian operation, and in 1988 the FNM badged commercial vehicles - already produced by a Fiat owned business since Alfa Romeo sold the business in 1973 - were rebadged as Iveco products. ↑ "alfa romeo's Brazilian connection 1950-1986". italiaspeed.com/2005. Retrieved 2008-06-28. ↑ "FNM". djjaragua.vilabol.uol.com.br (in Portuguese). Retrieved 2008-06-29. ↑ Shapiro, Helen (Winter 1991). "Determinants of Firm Entry into the Brazilian Automobile Manufacturing Industry, 1956-1968". The Business History Review. 65 (4, The Automobile Industry): 879. doi:10.2307/3117267. ↑ Cunha, Renato. "FABRAL e Alfa Romeo 102/B: o primeiro projeto" [FABRAL and the Alfa Romeo 102/B: the first project]. Crônicas Alfistas. Retrieved 2013-09-08. ↑ World Cars 1972. Bronxville, NY: L'Editrice dell'Automobile LEA/Herald Books. 1972. p. 266. ISBN 0-910714-04-5. ↑ "Toni Bianco". bandeiraquadriculada.com.br (in Portuguese). Retrieved 2008-06-28. ↑ "FNM - Alfa Romeo's Brazilian connection 1950-1986". italiaspeed.com. Retrieved 2008-06-28. ↑ "Brazilian trucks from the 'Brochure King'.". roadtransport.com. Retrieved 2009-06-04. 1 2 "The Alfa Romeo Rio, or Alfa Romeo 2300.". xs4all.nl. Retrieved 2008-06-28. Wikimedia Commons has media related to FNM vehicles.